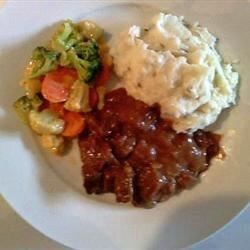 "A variation on Swiss Steak. Great for dinner after Curling." Preheat the oven to 350 degrees F (175 degrees C). Grease a 1 quart casserole dish or larger with sesame oil. Place the beef, cream of mushroom soup, soup mix and onion into the prepared baking dish and stir to blend. Cover and cook for 1 hour, or until meat is tender. I cooked this in the crockpot for dinner last weekend and we ate it on fettucine. It was wonderful.